And why I'm going to keep going (for the most part). In high school, after a scarring all-nighter reading a book called Slaughterhouse (not to be confused with Slaughterhouse Five), I announced over breakfast that I was vegan. My dad, to his credit, entertained my thirteen-year-old declaration by serving me toast—no butter, no eggs—but made roast chicken and risotto for dinner, anticipating that the idea would wear off by 8 p.m. Instead, I didn&apos;t eat a single animal product for the next two years until, as I like to say, "I got hungry." Despite an early appointment with a nutritionist who explained the importance of complete proteins, the dangers of too much soy, and the necessity of B-12 supplements to me, I was a tri-varsity athlete, and hungry all the time. After a grueling cross-country practice, and without any warning, I pulled my car over at Panda Express and ordered orange chicken (my life-long kryptonite). I always planned to try again in college, but the "vegan options," a.k.a. plain pasta, weren&apos;t realistic, and then I took a job as a food editor where tasting everything was practically a job requirement. Note: While I did my research for this article, there are a lot of sneaky things that aren&apos;t considered vegan (barbecue-flavored chips contain milk solids! some vanilla flavors come from beaver butts?). If any of the foods listed below aren&apos;t in fact vegan, let me know! 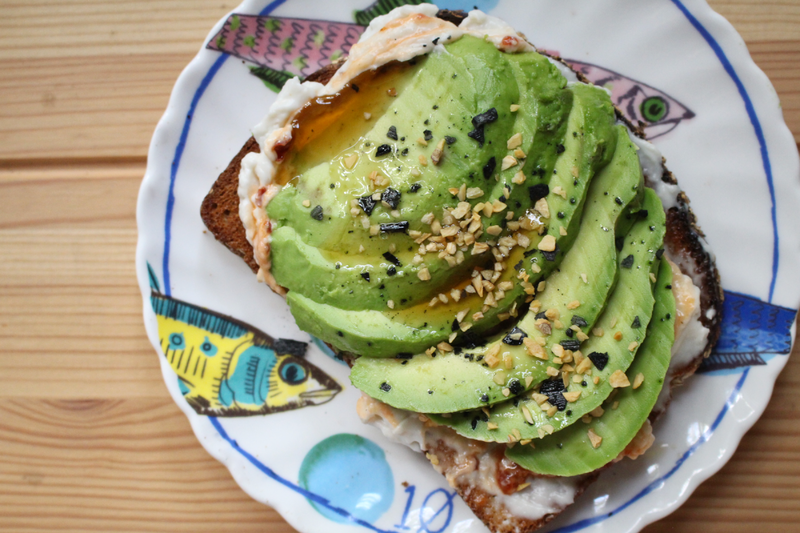 6:45 a.m. Almond milk latte and avocado toast with vegan mayonnaise, sesame oil, and sambal oelek: Usually I eat it plain on toast with lemon, but this time I took a tip from Gwenyth&apos;s cookbook and added vegan-aise for some extra calories and protein. 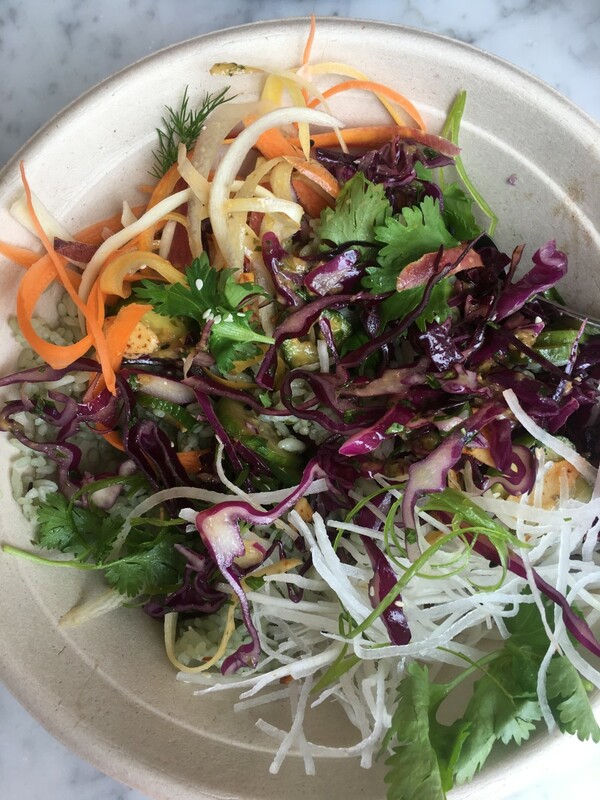 1:00 p.m. Miso grain bowl at Honey Hi: In L.A., they ask "With meat or vegetarian" with the same nonchalance of asking "still or sparkling," so I easily opted for the vegan version of my favorite grain bowl, the Miso Bowl, at Honey Hi. Recipe here (note: the dressing in this recipe contains honey). 7:00 p.m. Zucchini and leek soup, apple, and lime popsicle: About 24 hours into "going vegan," I started craving cheese like my life depended on it. Ate an apple instead (so not the same thing). Note: I considered buying a cheese alternative to use in this soup, but they&apos;re expensive! 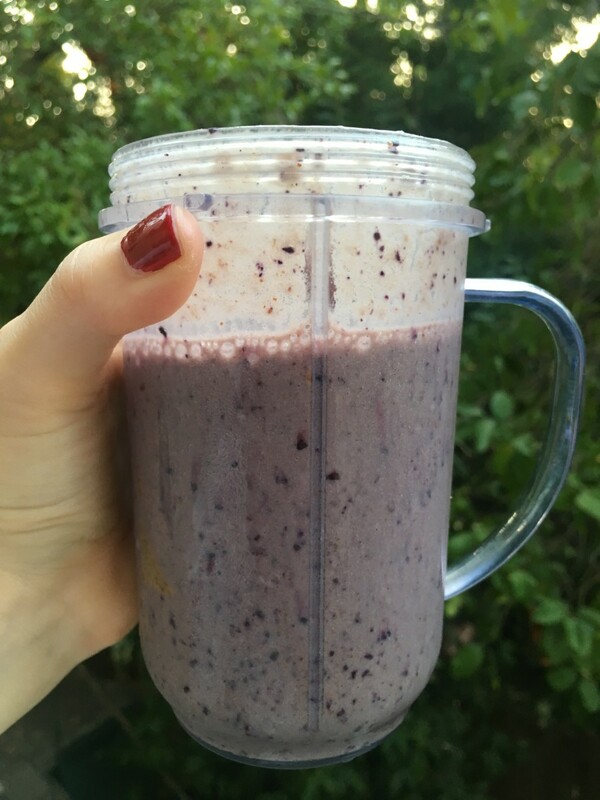 7 a.m. Banana, blueberry, and almond butter smoothie. Drank a smoothie after an early workout class while stuck in traffic (kind of wish I&apos;d eaten avocado toast Tuesday instead of Monday so that that sentence could be even more obnoxiously L.A.). Usually, my on-the-go breakfast also includes an R.X. Bar, but those contain egg whites. 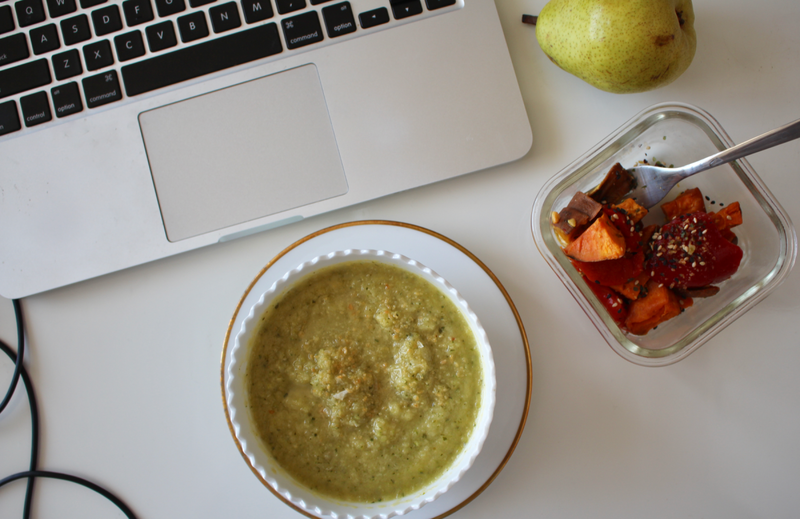 1:00 p.m. Zucchini-soup and roasted sweet potatoes, and an apple. 8:30 p.m. Soup and orzo: After a yoga class, I was starving and knew soup alone wouldn&apos;t cut it. Instead, I used the soup (which is essentially puréed zucchinni and leeks) as a pasta sauce over orzo. Ate a ton, but still felt hungry at the end. 7 a.m. Banana and almond butter smoothie: Made a smoothie at home before an early workout, so that I was able to drink it on my way to work! (Recipe: 1 ripe banana, 1 spoonful almond butter, 1 pitted date, 1 cup unsweetened almond milk, 2 tablespoons mushroom-based protein powder). 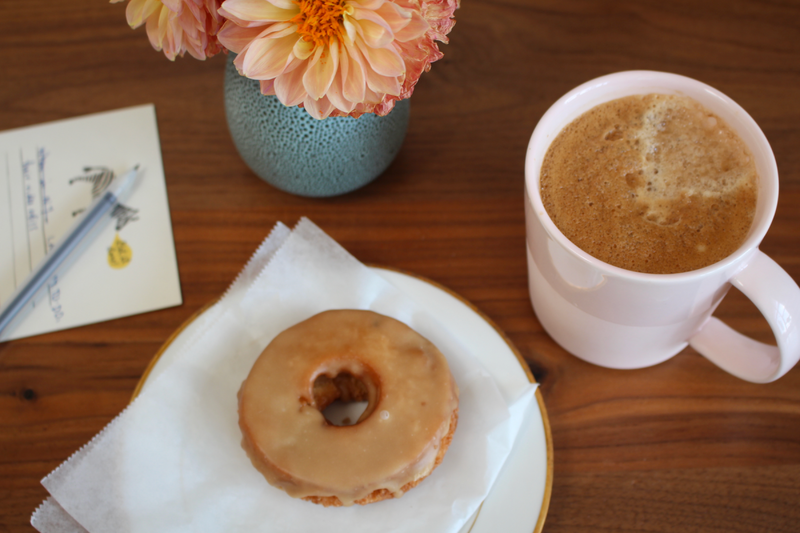 8:30 a.m. Vegan maple donut and almond milk latte: Post-smoothie, I stopped by a donut place with my boyfriend hoping they had vegan options (since it&apos;s bright-pink and trendy, I knew my chances were good). To my surprise, they had an entire case of options for me to choose from! Yay L.A.! Served it up alongside a Nespresso with almond milk. 8:30 p.m. Rigatoni with vegan sausage and spinach: After cancelling after-work dinner plans at the last minute, I scrounged in my pantry and fridge for a relatively healthy vegan meal and made a quick and simple pasta with vegan sausage, spinach, lemon, and olive oil. 9:00 a.m. Banana and almond butter smoothie: At a treadmill class this morning, I thought I was going to face-plant mid-sprint. 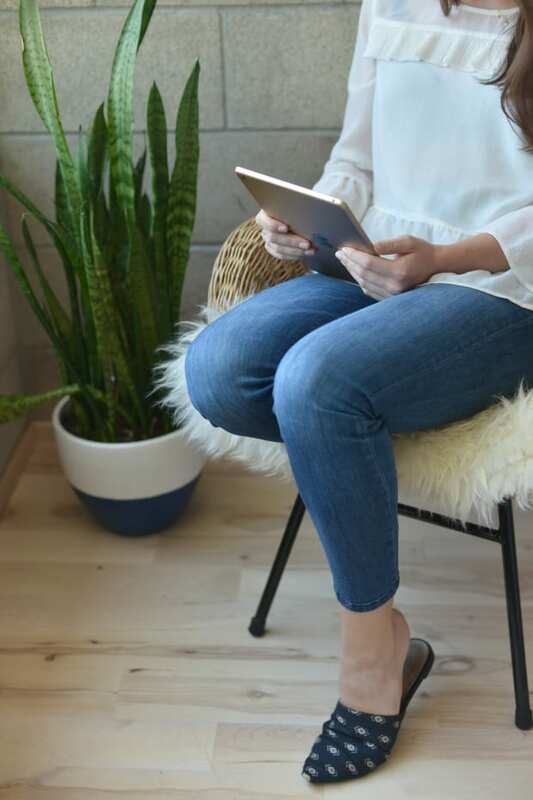 While the class is usually incredibly challenging, I felt fatigued in a way I couldn&apos;t pin-point and struggled to barely keep up with the class. 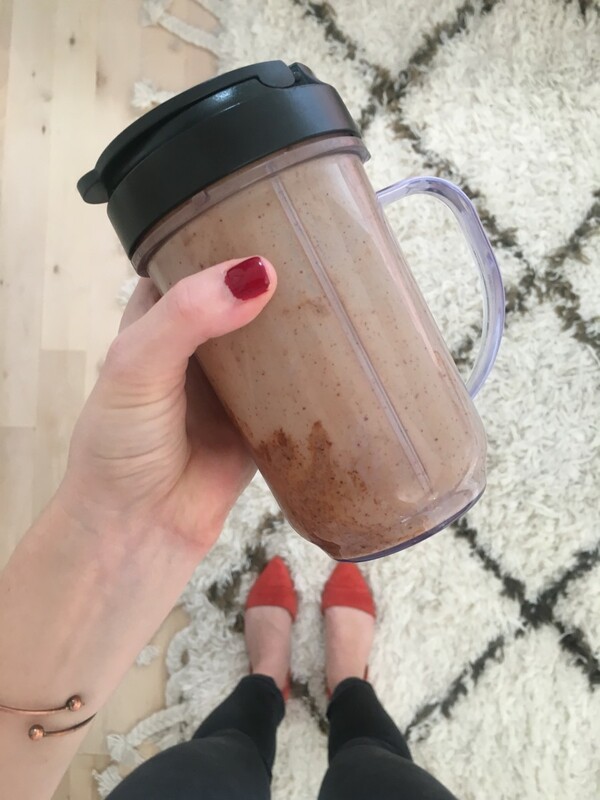 After downing my smoothie, I did a quick assessment and realized something you&apos;ve probably already noticed: I&apos;d hardly been eating any protein! While it&apos;s easy to get protein without even thinking about it in a meat-based diet, that&apos;s not the case in a vegan diet—here&apos;s a helpful guide! 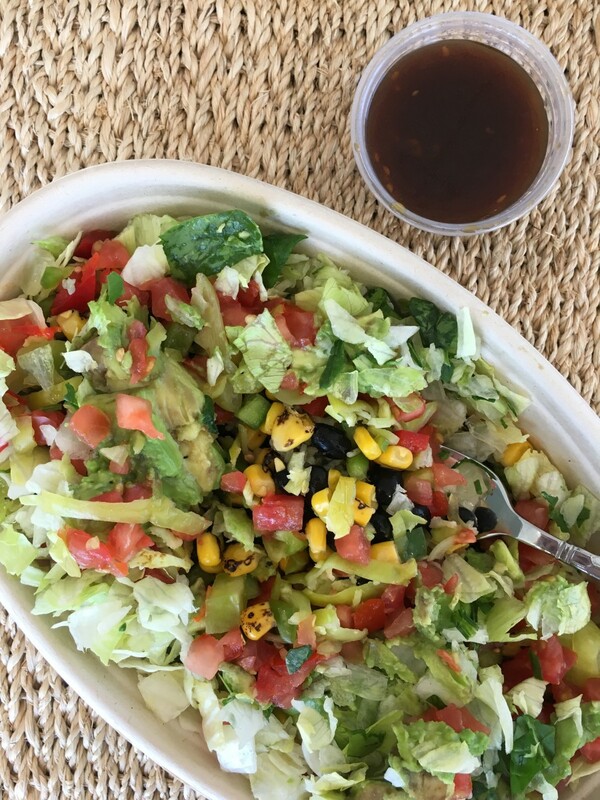 1:00 p.m. Rice, black beans, and roasted vegetable bowl: Another coworker also went vegan for the week to "detox" after several wedding weekends in a row, so we supported each other by ordering the same "Vegan Bowl," which came with all sorts of veggies and a healthy serving of avocado. It was delicious. 3:30 p.m. About a thousand rice cakes: I know these are widely regarded as one of the saddest snacks around, but I love them. And they&apos;re vegan! 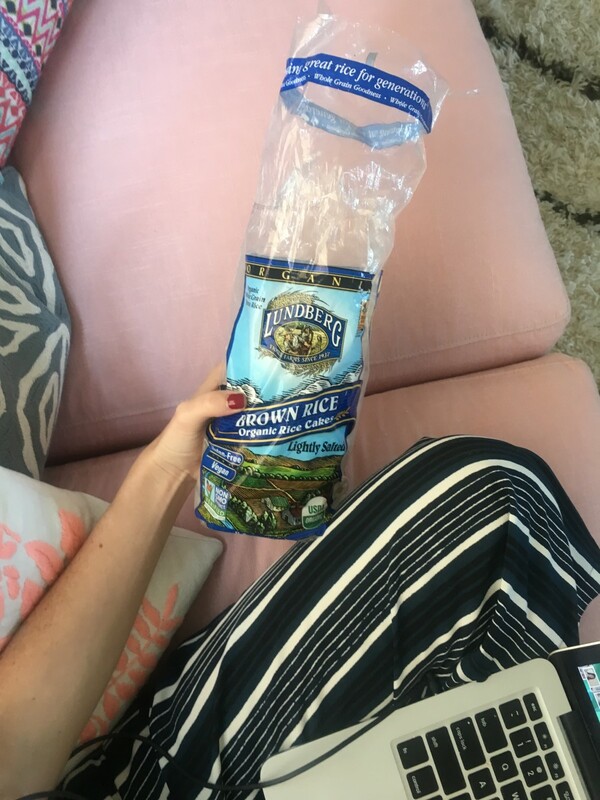 Ate about a thousand of them on the couch (the only thing I&apos;ll eat on the couch since I&apos;m terrified of spilling anything - it&apos;s too pretty!) during a marathon stretch of writing. 9:30 p.m. Tofu, rice, and curried garlic garbanzo beans and spinach: Right before heading home after a long day, I texted my boyfriend an SOS, "Hangry. Need protein," and arrived to a miso tofu baking away in the oven (if that isn&apos;t love, I don&apos;t know what is). We served it over rice with garbanzo beans and spinach cooked in the most amazing garlic-curry spread we just discovered. Best thing I&apos;d eaten in five days, hands down. 9:00 a.m. Banana and almond butter smoothie: These guys are quickly becoming my favorite post-workout breakfast (p.s., I felt SO much better in this morning&apos;s class after my evening of protein-loading). 10:00 a.m. Edamame snack: I had shelled frozen edamame in the fridge which I reheated and ate with a spoon. 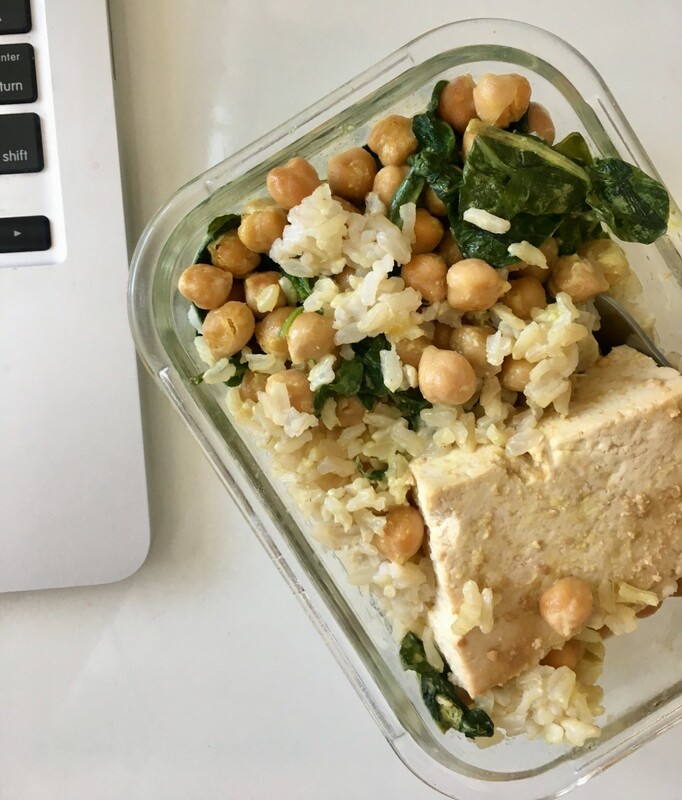 Thank God for Trader Joe&apos;s.
2:00 p.m. Tofu, rice, and curried garlic garbanzo beans and spinach leftovers: Simple, easy, still in love with this meal! 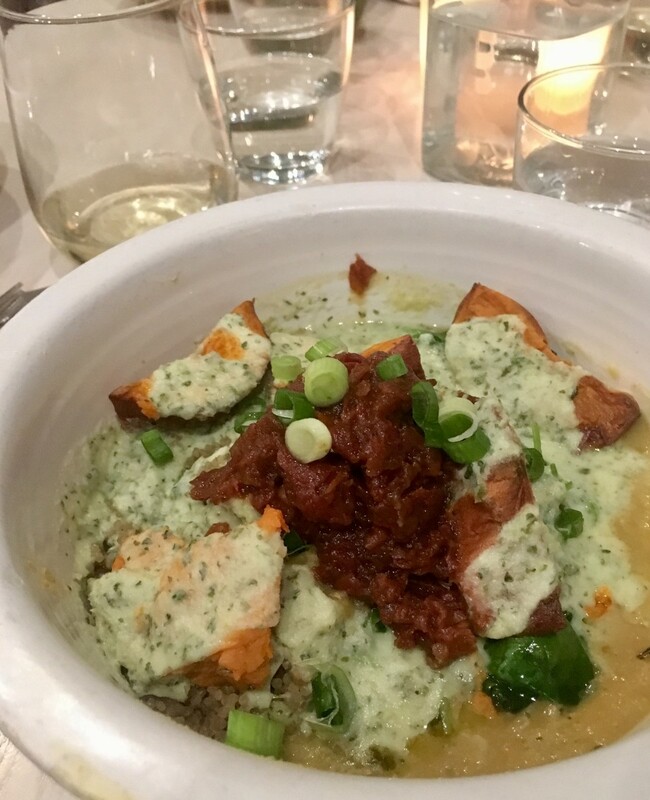 8:30 p.m. Indian curry bowl at Café Gratitude: Even if you&apos;ve never been to a Café Gratitude, a chain of vegan restaurants in L.A., you&apos;ve probably heard of them. Every item on the menu is listed as an affirmation (this dish I ordered was actually called an "I am Humble," which, yes, you have to say when ordering) and they pose a "question of the day" after taking orders. It&apos;s incredibly cheesy, and so L.A., and I wanted to hate it but I actually kind of loved it and I don&apos;t have a single bad thing to say about the "I Am Humble" or my girlfriends who are willing to go to all-vegan restaurants for the sake of a week-long food experiment. It was easy! I actually expected this week to be way harder than it was. 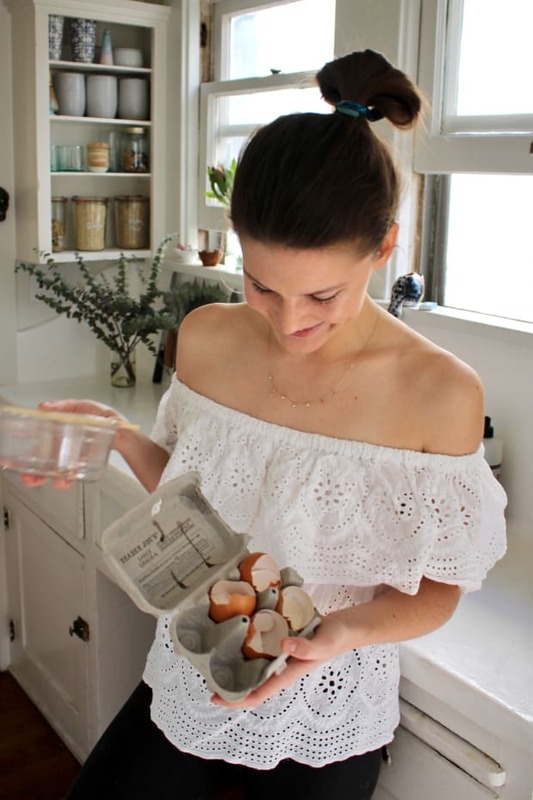 While I&apos;ve tried and failed at other diets like Whole 30 (my version was closer to Whole 2) being vegan was far easier for me for two reasons: 1.) Animal rights are more motivating to me than getting a bikini bod, 2.) Instead of being restricted by a list of foods I could and couldn&apos;t eat I just made substitutions. I replaced mayonnaise with vegan mayonnaise, milk with almond milk, and animal protein with beans, sausage, and tofu (which, for the record, are all far less expensive than meat). With so many replacement options, I didn&apos;t feel like I was missing out on anything—in a way, it actually felt like a treasure hunt! For the most part, I felt fantastic. I didn&apos;t intend to eat super-healthy this week, but I did almost by default! Since I wanted to make sure the foods I was eating were vegan, I cooked a lot and purchased filling whole foods. It also nearly eliminated mindless eating since I wanted to make sure, in the absence of animal-based protein, that the foods I was eating were providing me with enough nutrients to get through a busy work week and daily workouts. It&apos;s fun. Something I&apos;d forgotten about since high school, but quickly remembered, is how things feel that much more special when you do have them. Since sweets are hard to come by, I savored Wednesday&apos;s vegan donut that much more than I would have a regular donut. And I was downright thrilled to go out to eat at a restaurant where I could order anything off the menu. It&apos;s the little things. I&apos;m going to keep going, with adjustments. 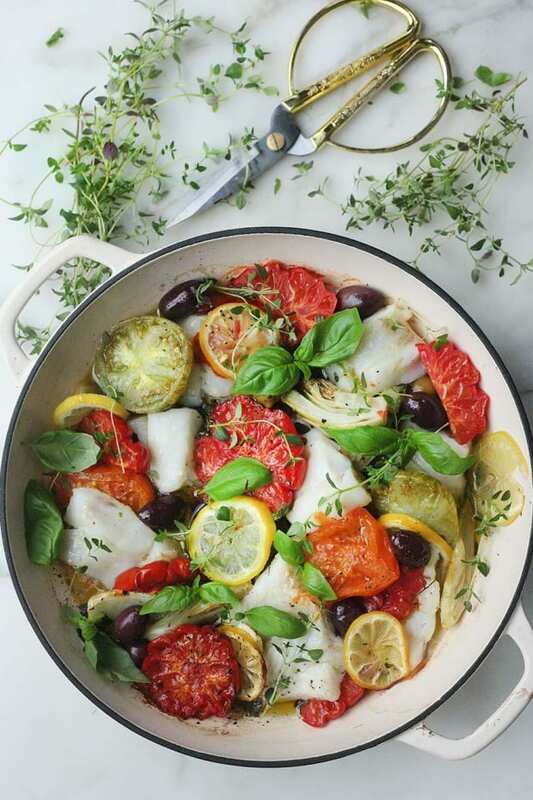 After realizing how easy it was—and how good I felt—I tried to keep going for a few weeks, but after some trial and error (during which I transitioned from "vegan" to "vegan with vices" to "vegetarian-ish"), I realized that it&apos;s much more realistic, and completely doable, for me to be pescatarian while being mindful of where my animal products come from. It&apos;s possible that I&apos;ll return to being vegan in the future, and being "pescatarian" doesn&apos;t mean I won&apos;t still be eating vegan most of the time, but it&apos;s hard to imagine going back to being omnivorous, aside from maybe trying food when I travel (since my issue is more with the American food industry than with killing animals—if you want something to convince you, read this article). For now, it just feels good to "vote" for what I believe in—the ethical treatment of animals and the environment—with each trip to the grocery store! What do you think? Are you vegan? Vegetarian? Could you never go vegan? And if you want to go vegan—power to you!—this is a great place to start.